This Special High Performance ATV delivers tons of fun for any 5–10 year-old, and there’s even a flip-up backrest for a passenger! 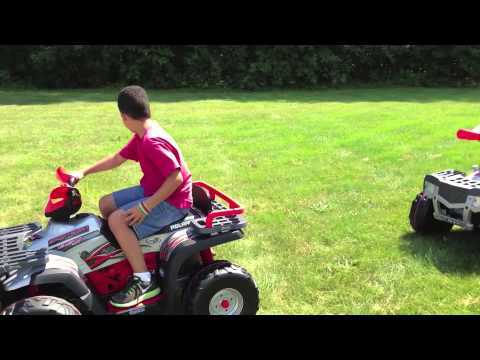 This 24-Volt rechargeable battery powered ATV has a foot pedal accelerator. Outdoor oriented kids will really enjoy the 850’s rugged, shock-absorbing suspension and knobby traction wheels as they cruise at 3½ to 7 mph / 5.6 kph to 11.2 kph on grass, dirt or hard terrain. There’s also a front and rear luggage rack. 24-volt rechargeable High Output battery and charger included. Made in the USA.